This fascinating graph by US investment bank JP Morgan shows the share of total world GDP for major powers for the last 2,000 years. It’s worth noting the return of the giant Asian powers as a fairly recent phenomenon. The time-axis is not to scale mind you. 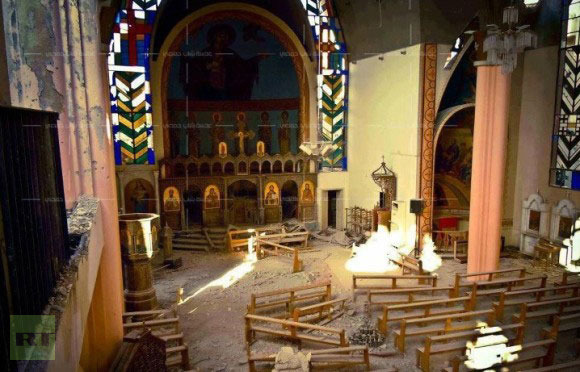 Christian churches are being desecrated and looted in the Syrian city of Homs. The raids are being carried out by the Free Syrian Army, which is backed by a large number of international players, the US, Britain, France, Turkey, al-Qaida, and the Muslim Brotherhood among them. Thousands of Christians have fled certain areas of Homs that fell into rebel hands in February. Meanwhile, US intelligence operatives and diplomats continue to step up their contacts with Syrian rebels to help organize their growing military operations against President Bashar al-Assad’s forces. According to senior US officials, the CIA and the State Department are helping the Free Syrian Army develop logistical routes for moving supplies into Syria and providing training in communications. Reportedly, Saudi Arabia and Qatar have been paying salaries to the Syrian rebels for several months now. Meanwhile, Turkey, which hosts some units of the Free Syrian Army, ensures material and technical support, according to sources. And many believe that as long as the US and its allies continue to blindly support the radical rebels, stability in Syria will remain unattainable. It’s time that Germany steps up and in the strongest terms condemn the US and its Islamist allies! The European Space Agency (ESA) is currently undertaking two studies in order to find use for its space truck, the Automated Transfer Vehicle (ATV), when it has completed all its missions to the International Space Station in 2014. 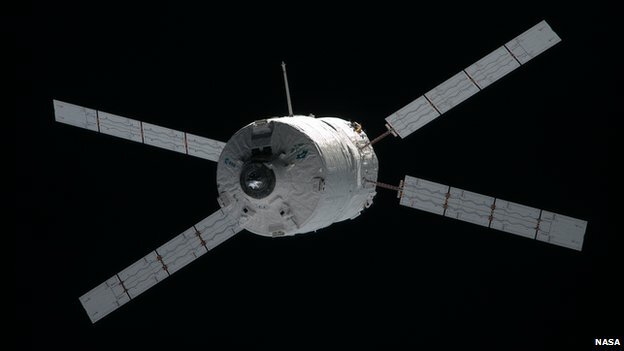 The ATV is an expendable, unmanned resupply spacecraft developed by the ESA and manufactured by Astrium Space Transportation in Germany. Five ATVs are designed to supply the International Space Station with propellant, water, air, payloads and experiments. 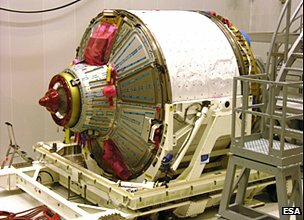 One of the studies will investigate whether the ATV’s service module section could provide propulsion for NASA’s Orion spacecraft, which is designed to carry astronauts to deep space destinations such as asteroids, the moon and Mars. This would give the European space manufacturer a major role in future space exploration. The other study envisages a future for the spacecraft in providing services in low-earth orbit such as pushing infrastructure around in space or serving as a vehicle for robots that fix or decommission old satellites. Three ATVs have already been launched with the latest one still orbiting with the ISS. The next ATV, named “Albert Einstein”, will be launched in Spring 2013. German Foreign Minister Guido Westerwelle is making visit to India and Bangladesh this week. One of the stops on his tour will be the dynamic southern Indian city of Bangalore where over a 150 German business are active. Germany and India have been working closely together for quite some time to reform the UN Security Council. Berlin and New Delhi both are seeking a permanent seat on the body. Mr Westerwelle seems at awe of the economic and strategic power of the rising Asian giants judging by his comment at a recent conference in Berlin entitled “Asia’s New Powers – Values, Economy, World Order”. During a panel discussion, Mr Westerwelle was carrying forward the tradition of German modesty and underestimating itself. Westerwelle said that while Germany certainly was important in Europe, its influence on the world stage was small and that “modesty” was in order. He also stated that “We are no longer setting the pace”. For realist with a good grasp of the view from Asia, Westerwelle’s views – which are fairly typical of a northern European politician – seem somewhat too modest. Germany is the world’s second largest exporter and the leading voice in Europe. A stronger voice in world affairs is held back only by Germany’s own lack of ambition, not by growing Asian powers.Moreover, Westerwelle was of the opinion that only a united Europe would have a greater influence on the world. That notion seems at odds with how events are developing in the continent. German Foreign Minister Guido Westerwelle – the face of timidity? The Dutch Parliament voted last week to boost its military contribution to the NATO force fighting piracy in Somali. The country will spend $16.5 million to provide extra personnel, two Cougar helicopters and an unmanned aerial vehicle to join NATO’s Operation Ocean Shield. Also part of the new deployment will be an additional submarine to join the mission in the second half of 2012. This week the Dutch frigate HNLMS Van Amstel set to return to the Netherlands after anti-piracy service in the western Indian Ocean. It is being replaced by HNLMS Evertsen up until September. Unrelated, the Indonesian Navy has agreed to buy a guided missile destroyer from the Dutch shipyard Damen Schelde Naval Shipbuilding for a total contract of $220 million. 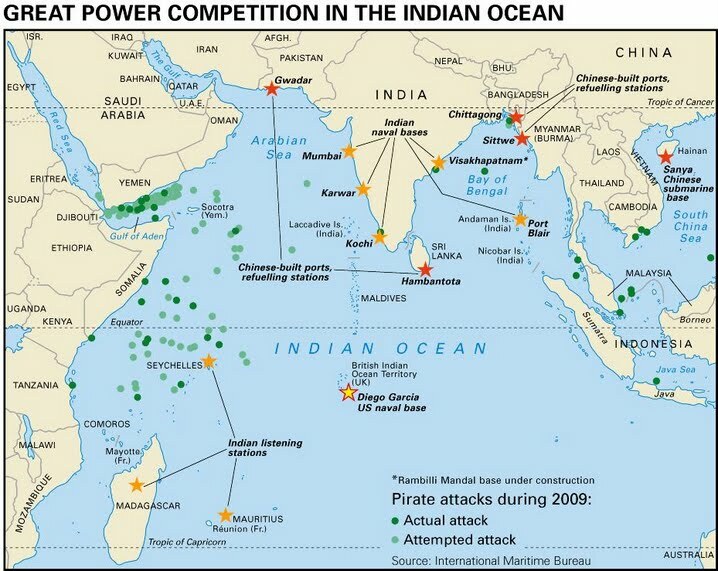 Military activity by foreign powers have been stepped up in the western Indian Ocean in the last decade. The immediate reason is the occurrence of Somali based pirates off the coast of East Africa. On a more strategic level the growing Asian powers are looking to take position in the waters that are vital to global shipping lanes. The traditional maritime powers in the region, the US, Britain and France have seen the Chinese taking up the hunt for pirates, but also an agreement and plans to set up a naval base in the Seychelles. It is believed that China is also negotiating with other countries in the region for further naval bases e.g. Gwadar Port in Pakistan, Sri Lanka and Tanzania. India is upgrading its own navy to include nuclear submarines and aircraft carriers to get supremacy over the ocean it regards as its backyard. India is clearly annoyed with Chinese activity in the Seychelles and on the island of Mauritius, which India considers part of its sphere of influence. Japan has opened a naval base in Djibouti in order to support its anti-pirate operations in the Gulf of Aden. This has further prompted China to seek a land base in the region. Where does this leave the traditional powers? One of the most important strategic military bases to the US, the island of Diego Garcia which it leases from the UK, is kept busy as a staging base for B-2 bomber raids over Afghanistan. France is also clinging on to its bases in the region namely Réunion, Mayotte, Djibouti and the newly established base in United Arab Emirates. Together these form what the French calls quadrilatère français in order to secure France’s interests in the all important region. Given China’s massive investments in Africa – with the increasing clout this brings with African governments – it would not be surprising to see China trying to create a permanent land base on continental East Africa which would include naval and air support. According to Israeli news outlet DEBKAfile, which is known to be close to Israeli secret services, a joint military exercise is to be held in less than a months time by Iran, China, Russia and Syria on Syrian soil. The exercise would be one of the biggest ever held in the Middle East with over 90,000 personnel. According to the report, Beijing have already asked Egyptian authorities to permit the passage through the Suez Canal in late June of 12 naval ships heading for the Syrian port of Tartus, where Moscow maintains a naval and marine base. The news has not yet been confirmed by official sources and could, of course, be a case of deception. 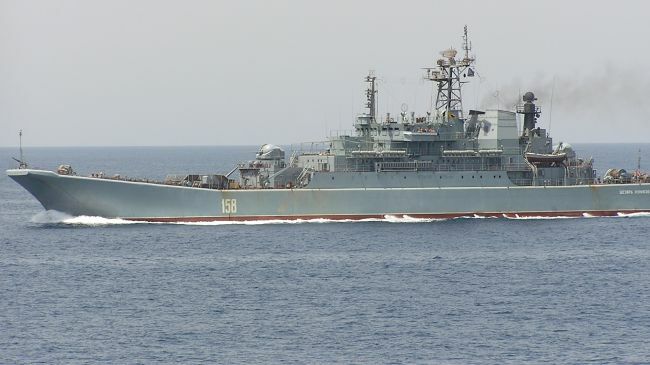 What has been confirmed though is that Russia is deploying two warships to the Syrian port of Tartus, both ships are said to carry large number of marine soldiers. Where to now for Nokia? The Finnish mobile handset and network manufacturer has had a hard time since the release of Apple’s iPhone and the various Android phones. The company, which was once the most valuable in Europe, is continuing to lose money and has now shed an additional 10,000 jobs leaving it to concentrate on the Windows Phone platform in the smartphone market. The Espoo, Finland based company is still big in the market for traditional basic phones, but the margins in that sector are increasingly thin. With its share price now lower even than it was in 1995 valuing the company at around $8 Billion – but with more than 10,000 patents and strong brand value – the company is seen as an attractive takeover target. An obvious buyer would be Microsoft, who would want to keep the phone afloat in order to build its Windows Phone platform. Nokia could also be a great fit for an Asian manufacturer looking to buy into an established brand. China’s telecommunications manufacturer Huawei or the handset maker ZTE Corp would fit that bill, as would Taiwan’s handset maker HTC, which already has a successful phone range on the Android platform. South Korea’s Samsung is probably less likely to be in the market for Nokia given its own strong brand name, but it can’t be ruled out. There are similarities with Chinese automaker Geely’s 2o10 takeover of Swedish car manufacturer Volvo. The company has since injected billions into Volvo and sales are improving. It remains to be seen whether cultural differences can be overcome and a combined entity can go forward to create successful Scandinavian-Chinese technology champions.